Banks, companies and trading partners targeted by new scheme. 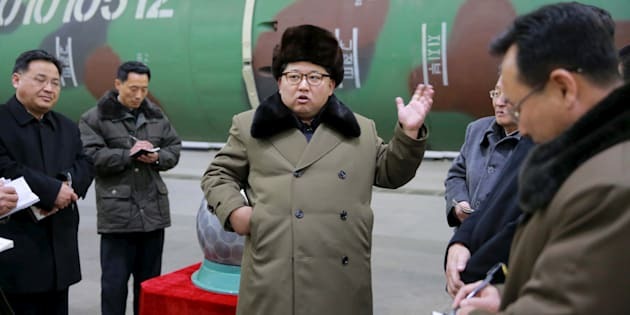 North Korean leader Kim Jong Un meets scientists and technicians in the field of research into nuclear weapons in this photo released by North Korea's Korean Central News Agency. NEW YORK, Sept 21 (Reuters) - U.S. President Donald Trump ordered new sanctions on Thursday that open the door wider to blacklisting people and entities doing business with North Korea, including its shipping and trade networks, further tightening the screws on Pyongyang's nuclear and missile programs. Trump stopped short of going after North Korea's biggest trading partner, China, praising as "tremendous" the central bank's move ordering Chinese banks to stop doing business with North Korea. The additional sanctions on Pyongyang showed that Trump was giving more time for economic pressures to weigh on North Korea after warning about the possibility of military action on Tuesday in his first speech to the United Nations. Asked ahead of a lunch meeting with the leaders of Japan and South Korea if diplomacy was still possible, Trump nodded his head and said, "Why not?" North Korea has launched dozens of missiles under Kim Jong Un's leadership as it accelerates a weapons program designed to give it the ability to target the United States with a powerful, nuclear-tipped missile. Resisting intensifying international pressure, Pyongyang conducted its sixth and largest nuclear test on Sept. 3 and has launched numerous missiles this year, including two intercontinental ballistic missiles. Trump said the new executive order "significantly expands our authority to target individual companies, financial institutions, that finance and facilitate trade with North Korea" and "will cut off sources of revenue that fund North Korea's efforts to develop the deadliest weapons known to humankind." The U.S. Treasury Department now had authority to target those that conduct "significant trade in goods, services or technology with North Korea." Trump did not mention Pyongyang's oil trade. The White House, in a statement, later said North Korea's energy, medical, mining, textiles and transportation industries were among those targeted and that the U.S. Treasury could sanction anyone who owns, controls or operates a port of entry in North Korea. Four sources earlier told Reuters that China's central bank has told banks to strictly implement United Nations sanctions against North Korea. "No bank in any country should be used to facilitate Kim Jong Un's destructive behavior," Mnuchin told reporters. "Foreign financial institutions are now on notice that going forward they can choose to do business with the United States or with North Korea, but not both." Mnuchin said any sanctions issued under the new executive order signed by Trump on Thursday would be forward-looking and not target past behavior. New sanctions signed today by Trump ban planes/ships from landing/docking in the US if they've been in NK in the past 180 days. European Union ambassadors have reached an initial agreement to impose more economicsanctions on North Korea, going beyond the latest round of U.N. measures, officials and diplomats said. Trump warned the North Korean leader in his U.N. address on Tuesday that the United States, if threatened, would "totally destroy" his country of 26 million people. It was Trump's most direct military threat to attack North Korea and his latest expression of concern about Pyongyang's repeated launching of ballistic missiles over Japan and underground nuclear tests. South Korean President Moon Jae-in, who met with Trump on Thursday and addressed the U.N. General Assembly, said sanctions were needed to bring Pyongyang to the negotiating table and force it to give up its nuclear weapons, but Seoul was not seeking North Korea's collapse. "All of our endeavors are to prevent war from breaking out and maintain peace," Moon said in his speech. He warned the nuclear issue had to be managed stably so that "accidental military clashes will not destroy peace." China's foreign minister Wang Yi called on North Korea not to go further in a "dangerous direction" with its nuclear program and said negotiation was the only way out of the crisis over Pyongyang's weapons development, calling on all parties to help ease tensions. "There is still hope for peace and we must not give up. Negotiation is the only way out ... Parties should meet each other half way, by addressing each other's legitimate concerns." Japanese Prime Minister Shinzo Abe who was at the lunch said "dialog for the sake of dialog will not produce anything," urging that pressure on Pyongyang be applied in a "robust manner." Two missiles fired by North Korea in recent weeks flew over Japan. In Geneva, North Korea told a U.N. rights panel that international sanctions would endanger the survival of North Korean children. Children prepare for a performance in Onchon County near Pyongyang, North Korea. Anthony Ruggiero with the Foundation for Defense of Democracies think tank said of Trump's order: "This approach worked with Iran as companies, banks, governments and individuals chose the United States, and likely will restrict North Korea's revenue." Last month, the Trump administration blacklisted 16 Chinese, Russian and Singaporean companies and people for trading with banned North Korean entities, including in coal, oil and metals.